xi, 124 p. : ill. ; 28 cm. Thesis (M.S.) --University of Florida, 1999. Includes bibliographical references (p. 120-123). I would like to express my sincere appreciation to my advisor and supervisor committee chairman, Dr. Robert G. Dean, for his enthusiastic, constructive, and constant support during my past two years. His continuous research for answers to littoral processes has been a source of valuable discussions. I would also like to thank Dr. Ashish J. Mehta and Dr. Robert J. Thieke for serving on my committee and for being my professors in different interesting classes. My gratitude is also extended to the staff of the' Coastal and Oceanographic Engineering Department, including Becky, Subarna, Lucy, Sandra, and Helen, who made my presence here enjoyable. Special thanks are for the coastal students, with whom I played exciting and exhausting football games, especially Kevin, Vadim, Justin, Joel, Erica, Daniel and Edward. My thanks go to Adam, who introduced me to the coastal department when I first arrived here, and to Thanasis, Yeon Sihk, Ki Jin, and Haifeng for their precious companionship and help when needed. Particular thanks go to Guillermo, Nicholas, Al and Jamie, with whom I shared the same office and unforgettable moments. I would like to thank my parents and family for their constant and precious support, which allowed me to go ahead and complete this constructive experience. Special thanks go to my uncle Giovanni and my aunt for their important advices and support. Finally, I would especially like to thank Teresa for staying morally close to me during these past two years, believing in us, and for giving me her complete support for the realization of one of my life's goals. 3.9 (Panel a) Annual Shoreline Change Rate for the Period 1992 to 1996.
from 1993 to 1995(Panel a) for Each Survey Time Interval. The occurrence of erosional hot spots within the limits of beach nourishment projects is one of the most perplexing and expensive aspects of this soft structure engineering solution to beach erosion. Erosional hot spots have been observed to occur in many otherwise successful beach restoration projects and, unfortunately, contribute significantly to the overall cost of the project and to the negative public perception of its performance. Erosional hot spots are due to coastal processes which act on a local scale and therefore are not predictable from a large scale analysis. In this thesis a review of the different types and causes of erosional hot spots, either anthropogenic or natural, is presented, together with formalized criteria to identify their presence not only within the limits of the beach nourishment project, but also adjacent to the projects. Also, guidelines to understand the possible causes of erosional hot spots are suggested, with the aim to simplify the diagnostic process. Two case studies of erosional hot spots are discussed; in the Dade and Manatee County beach nourishment projects. In both cases, shoreline and volumetric change analyses were conducted, showing that the formation of erosional hot spots is a highly 3-dimensional nearshore process, which includes cross-shore and longshore sediment transport components. The one-line numerical model DNRBS was applied to both projects, and the results show a qualitative agreement in large scale, especially in volumetric terms, but with less agreement on the local scale. The application of detailed refraction/diffraction models to better understand the shoreline response to local nonuniform bathymetry, such as borrow pits, and wave conditions may improve prediction capabilities substantially. Wave action causes the most significant changes in beach morphology. Large volumes of sand are carried offshore and onshore over a period of time, and also carried along shore by the action of oblique waves. In the proximity of inlets, tide and current effects also become significant. It is of critical importance to understand and to be able to manage the dynamic coastal environment, which has experienced increasing human pressure for shore development, recreational facilities and shore protection from storm surge damage. Past shore protection practices have included hard structures such as groins, jetties and seawalls along the coast, resulting in undesirable sand accumulation or erosion due to interference with on/offshore and longshore sediment transport processes. More recently, soft structures have been implemented to prevent coastal erosion. One of the most effective is the beach nourishment, which consists of the placement of large quantities of good quality sand in the nearshore system in order to create or restore a beach system. Due to its high cost, this engineering solution is usually justified in those areas characterized by high tourist, residential, and environmental values. One of the benefits of this soft approach is that supplying additional sand does not adversely affect adjacent beaches. Conversely, one of the most perplexing and expensive aspects of the beach nourishment solution is the occurrence of erosional hot spots within the limits of the project. An erosional hot spot is defined as a limited area which erodes more rapidly and/or equilibrates with a significantly narrower beach width compared to the adjacent beaches. Erosional hot spots have been observed to occur in many successful beach nourishment projects and can contribute significantly to the overall cost of the project and to the negative perception of its performance. As an example, the Dade County beach nourishment project, constructed between 1976 and 1982 with the placement of approximately 10 million m3 of sand on the nearshore, analyses have shown that in more than 15 years its performance has been globally excellent, except for some local areas where the shoreline has receded faster or equilibrated with a narrower dry beach width. Different tools are available to predict the shoreline response to the construction of a beach nourishment project. Some tools focus more on the beach planfonn evolution such as the numerical computer model DNRBS (Dean and Grant, 1989) and Genesis (Hanson and Kraus, 1989). Others focus more on the beach profile evolution, such as SBEACH (Larson and Kraus, 1989) and EDUNE (Kriebel and Dean, 1985). In all these models, average input characteristics are considered such as sediment size, depth of limiting motion, wave conditions and in some cases contours, which allow reasonable predictions of the large scale evolution of the beach system, but they are not able to predict localized (a few hundreds of meters) shoreline and/or volume evolution. One of the objectives of this thesis is to determine general criteria to identify the presence of erosional hot spots inside or outside the limits of beach nourishment projects and also, to propose a guideline to assist in identifying the possible causes of erosional hot spot. This thesis provides a review of different types and potential causes of erosional hot spots. Criteria to identify the presence of erosional hot spots and a guideline to understand the possible causes will also be introduced. Two study cases will be analyzed and the results discussed following previous criteria. Finally, conclusions will be drawn concerning the causes of hot spots, and recommendations for research to provide further understanding of the underlying processes will be proposed. Beach nourishment is one of the most non-intrusive technique used to protect shorelines and coastal structures and it consists of the placement of good quality sand on the beach in order to create or restore a beach platform for recreational and storm protection purposes. One of the benefits of this soft approach is that supplying additional sand does not adversely affect adjacent beaches. Conversely, one of the most perplexing and expensive aspects of the beach nourishment approach is the occurrence of erosional hot spots within the limits of the project. An erosional hot spot is defined as a limited area which erodes more rapidly and/or equilibrated with a significantly narrower beach width compared to the adjacent beaches. Erosional hot spots have been observed to occur in many beach nourishment projects and contribute significantly to the overall cost of the project and to the negative public perception of its performance. Bridges (1995) identified at least eight different mechanisms of erosional hot spot formation, which can be generated by pre-existing conditions or by design and/or construction procedures. The characteristics of each different mechanism are discussed briefly below, together with some examples of erosional hot spots. The presence of erosional hot spots (EHS), as well as cold spots (ECS), within the limits of different beach nourishment projects has been noted in many monitoring reports. In some cases, it has been observed that more than one mechanism contributed to the formation of hot spots. Various causes of erosional hot spots are reviewed below. while they were developing a method for representing wave refraction and shoaling in the vicinity of beach nourishment projects. Very often the borrow pits are located immediately offshore the littoral segment to be nourished. Depending on the distance from the shoreline the borrow pits may influence the wave front orientation as well as the wave energy distribution along the beach through wave refraction, reflection and diffraction. The result on the shoreline could be an erosional hot spot or a cold spot, which is an area where the shoreline accretes due to accumulation of sand. It is very common to see cold spots adjacent to erosional hot spots. Different studies have been conducted in order to determine the influence of dredged holes on the shoreline. These studies identified that the shoreline changes are caused by two different but simultaneous processes, wave refraction and wave diffraction, and depending on which process is predominant, the formation of an erosional hot spot and of a salient could be observed, respectively. Motyka and Willis (1974) noted that if refraction were the only mechanism to induce longshore currents, a significant erosion would be observed in the lee of dredged holes. A nodal point would be located in the shoreline behind the pit. The described mechanism is shown in Figure 2. 1. Horikawa et al. (1977) conducted computer simulations and laboratory studies of the influence of dredged holes on the shoreline. The theoretical and laboratory investigations both showed the formation of a salient in the area behind the borrow pit and the formation of hot spots in the adjacent areas (see Figure 2.2). Figure 2.1 Effect of Wave Refraction Behind a Borrow Pit. (From Bridges, 1995). Figure 2.2 Beach Plan Shape due to a dredged hole. Horikawa et al. suggested that sand accumulates behind the dredged hole where wave action is reduced and calm water is created. The process suggested by Horikawa was supported by the monitoring data of the 1984 Grand Isle, Louisiana nourishment project provided by Combe and Soileau (1987), which documented the formation of two salients in the lee of two borrow pits, and consequently the formation of erosional hot spots in the adjacent areas. Gravens and Rosati (1994) concluded that the resulting nearshore currents are generated by the longshore gradients in wave set up, which similarly follows the longshore wave height distribution shown in Figure 2.3. The resulting currents and associated sediment transports will go from regions of greater to lower wave set up, therefore, from the extremity areas to the central area of the dredged hole lee, favoring the sediment deposition in the central area. McDougal, et al. (1995) investigated the effects of dredged holes on the wave field. The presence of a partial standing wave in the region immediately seaward of the borrow pit and a zone of lower wave height in the landward region was observed, in agreement with the results of Horikawa et al. (Figure 2.4). The particular location of the borrow pits as well as of an undredged area in the general borrow area, seems to be one of the causes of the Delray Beach (Florida) hot spot. The undredged zone is located between two borrow pits, acting like a shoal, therefore, focusing wave energy in its lee. This process contributes to the formation of lower wave energy area behind the adjacent borrow pits. Note that more research is needed to better understand which combination of borrow pit parameters (dredging depth, alongshore length, offshore distance, etc.) cause perturbations to the shoreline. Longshore Distance Figure 2.3 Wave Height Distribution at Different Cross-Shore Distances. Contours of Diffraction Coefficient for Single Pit with a/L=1.0, b/L=0.5, d/h=3, kh=O.167, and Normal Wave Incidence, Where a, b, d, L, h, and k Are the Pit Length, Pit Width, Pit Depth, Wave Length, Seaward Water Depth, Wave Number. Waves Propagate from Left to Right (From McDougal et al.,1995). An offshore bar or reef can behave as a submerged breakwater reducing the wave energy impacting on the shoreline immediately landward. If there are breaks along the offshore bar or reef, greater wave energy will result immediately landward of the break, indenting the shoreline in that particular area. Breaks in bars can be a result of a natural process or of a man-made action. Although the mechanism for bar break formation is not completely understood, its effects on the shoreline are similar to those of gaps between breakwaters, which have been well investigated by Penny and Price (1952).The results were presented in plots showing the isolines of the diffraction coefficient behind the breakwater gap for different widths and for normal wave incidence. Figure 2.5 presents an example for a gap that is 2.5 wave lengths long. (From Penny and Price, 1952). It is seen that the greater diffraction coefficients, which are directly related to the wave heights, are located behind the gap and similarly behind the bar break. The larger wave height relative to the adjacent areas will generate a Iongshore sediment transport directed out of the area behind the bar break, causing the formation of a hot spot. In these cases, it is not unusual to identify the presence of cold spots immediately beside hot spots. An example of this formatioii mechanism of erosional hot spots can be seen in a littoral segment of Fire Island, New York, where a much higher erosion rate has been experienced due to a break in the offshore bar (Dean, 1995). --- BorrowSiA Borrow Sita -.. Figure 2.6 Plan View of a Hot Spot Due to Dredge Selectivity (From Bridges, 1995). with finer sand than the extremities. Considering only the cross-shore response of the beach nourishment project (neglecting the longshore response, as the transport of sand out of the area placed), after the beach reaches equilibrium, a narrower dry beach width occurs for the area filled with finer sand. Moreover, the equilibration process of the littoral segment with finer sand is faster (greater erosion rate), emphasizing in this way one of the defining characteristics of hot spots. This mechanism of formation of hot spots was recognized by Coastal Planning and Engineering as one of the causes of the hot spots on the nourishment projects of Longboat Key, Florida, and Captiva Island (1991), Florida. be utilized. An artificial headland can result through hardening these sections of the shoreline as the adjacent shorelines continuing to recede. If the beach is nourished to a uniform additional beach width (see Figure 2.7), the hardened section will actually protrude unnaturally beyond the adjacent shorelines. The protrusion tends to be eliminated by the wave action which redistributes the sand from the perturbation (higher wave energy density) to the adjacent beaches (lower wave energy density). This results in the observation of an apparent erosional hot spot with adjacent cold spots. This concept has been introduced by Olsen Associates, Inc. (1993), and by Coastal Planning and Engineering (199 1) while they were examining hot spots on Hilton Head Island and Captiva Island, respectively. Aerial photos and historical shoreline changes can be effective tools to check for such type of protrusions. Figure 2.7 Plan View of a Hot Spot due to Headland Effect. Figure 2.8 Eroding Profile Evolution in Front of a Seawall. has to be placed in front of the armored area, to create an incipient beach. If this threshold volume of sand is not considered, a percentage of the placed sand will create the equilibrium incipient beach, therefore, gaining a narrower dry beach width than expected. Olsen Associates, Inc. (1993), and Coastal Planning and Engineering recognized this erosional hot spot formation mechanism while examining hot spots in Hilton Head Island, South Carolina, and Longboat Key, respectively. Note that in those places where the seawall has also had a headland effect as discussed in the previous type, a combination of these two mechanisms can occur. the designed shoreline advancement. Therefore, this section of the beach will experience a higher erosion rate and so will be identified as an erosional hot spot. This hot spot formation mechanism was identified by Coastal Planning and Engineering while investigating on the causes of hot spots in Longboat Key where a groin field was removed before the construction of the beach nourishment. Note that this process can also occur when the groin field is not removed, and the nourishment is extended seaward such that the holding effect of the groins is reduced. 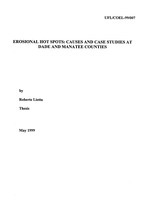 Associates, Inc. (1993), while conducting studies on the causes of hot spots in Hilton Head Island. This chapter illustrates erosional hot spot occurrence through the analysis of two beach nourishment projects: (1) Dade County, FL and (2) Anna Maria Key, FL. The study area is located in Dade County on the southeast coast of Florida (Figure 3.1) and includes the beaches of Bal Harbour, Surfside, and Miami Beach. The study area is a sandy barrier island approximately 14.8 km (9.2 miles) long and is bounded to the north by Bakers Haulover Inlet and to the south by Government Cut. The area of interest is shown on National Oceanic and Atmospheric Administration (N.O.A.A.) Nautical charts from no. 11465 through no. 11468, plus others.The limits of the present study extend to the littoral segment located between Bakers Haulover Inlet on the north and Government on the south focusing particularly on the areas where erosional hot spots (EHS) have been recognized. including the construction of two jetties. included the construction of two jetties.
" The September 1926 hurricane which impacted the Miami area. * The construction of a system of seawalls and abutting groins along the beach. * The encroachment of construction onto the active beach.
" Renourishments in 1960-69, 1981-92 and 1994. Each of these is discussed in the following sections. Figure 3.1 Dade County Location. The initial Government Cut federal navigation project commenced in 1904 and included the construction of a north jetty, which was extended seaward different times in subsequent years, reaching the present length of 1,434 m. (4,688 feet) in 1929. It was repaired and sand tightened in 1959-60 in order to reduce the deposition of sand in the entrance channel, due to the longshore sediment transport toward the south. In 1973, another project to further sand-tighten the north jetty was conducted. At that time, significant quantities of sand and rock were placed along the north side of the jetty. After the beach nourishment project was completed in 1982, another repair effort was necessary to sand-tighten the more seaward section of the jetty. The Bakers Haulover Inlet project was excavated in 1925 and sponsored by local interests. It was stabilized by two short jetties. After the south jetty was destroyed by the 1926 hurricane, it was rebuilt in 1964, as part of a Federal navigation project. In July 1975, the south jetty was extended seaward about 224 m (735 feet) and curved southerly to deflect alongshore currents to the south and encourage a gyre to reduce these currents and minimize sand losses. depths over the island up to 1.0 m (3 feet), and with water ponded in a few places near the ocean to an elevation of from 3 m (10 to 11 feet) above MLW. During the hurricane, a large amount of sand was transported up to 300 m (1,000 feet) inland from the beach, covering the streets of the city with 1 m (3 feet) of sand" (Wiegel, 1992). It was also during this hurricane that the north and south jetties of Bakers Haulover Inlet were destroyed and the bridge, located landward of the jetty, was left standing 49 m (160 feet) offshore as a result of erosion. Later the bridge was relocated farther landward. The development of the Miami Beach area resulted in many hotels and private construction located close to the shoreline. In some cases, hotels expanded their facilities seaward of the existing MHW. An almost continuous line of seawalls was built to protect these facilities from wave attack. These seawalls survived surprisingly well during the 1926 hurricane. After the 1926 hurricane, in order to stabilize the shoreline, a system of perpendicular groins was built from Bakers Haulover Inlet to Lummus Park, located approximately 2 km north of Government Cut. Most of these groins were sponsored by private interests. Many extended up to 50 m ( 164 ft) seaward of the MHW line. By 1975, more than 14.6 km (48,000 linear feet) of seawalls and numerous groins have been constructed. beach erosion control and also to provide hurricane protection for a storm of intensity similar to that which had occurred in 1926. Moreover, it provided a recreational beach along Dade County. The design increased the beach width by 75-90 m (250-300 feet) and included a dune with an elevation of 3.5 m (11.5 feet) above MLW. The design life of the project was 50 years, with estimated renourishment on the order of 145,160 m3/year (191,000 yd3/year) for the reach between Government Cut and Bakers Haulover Inlet, amounting to 9.35 m3/year per meter (3.75 yd /year per foot), (R. L. Wiegel, 1992). The total amount of fill was approximately 10.5 million m3 (13.9 million yd3), including the 1975 Bal Harbour fill. The sand was dredged from nearby offshore borrow areas and pumped to the beach, as shown in Figure 3.2. The seawalls and the abutting groins were not removed but were covered by the fill. Local interests had placed sand south of Bakers Haulover Inlet on six occasions between September 1960 and August 1969, averaging 23,180 m3 /year (30,500 yd3/year). Also in July 1975, local interests contracted for the placement of 1.235 million m3 (1.625 million yd3) of beach fill along the 1.37 km (0.85 mile) Bal Harbour reach; at the same time, as noted previously, the south jetty of Bakers Haulover Inlet was extended approximately 224 m (735 feet). Due to the magnitude of the complete Dade County project, it was realized in five different phases and contracts (Figure 3.3), which are summarized in Table 3.1. Note that the cost per cubic yard of the nourishment increased in time. The total amount of sand placed was 10.6 million m3 (13.9 million yd3), including 1.26 million m3 (1.65 million yd3) of 1975 Bal Harbour fill. Figure 3.2 Borrow Site Location for Dade County, Beach Nourishment Project. As noted previously, before the Dade County Beach Erosion and Hurricane Surge Protection Project was constructed, local interests placed sand south of Bakers Haulover Inlet between 1960 and 1969, averaging 23,300 m3/year (30,500 yd3/year). After the project was constructed, in some particular areas, renourishment projects were required: 122,200 m3 (160,000 yd3) between 63rd and 71st Streets. (R-46 and R-41 Monuments) and 53,500 m3 (70,000 yd3) between 27th and 34th Streets (approximately between R-61 and R-58) were placed in 1985, and 175,700 m3 (230,000 yd3) placed at Bal Harbour Beach in 1990. Figure 3.3 Map of the Five Different Phases of the Beach Nourishment Project. Moreover, 91,700 m3 (120,000 yd3) of sand were placed between R-55 and R-56 in 1994 (Dade County Regional Sediment Budget, 1997). The total renourishment up to 1998 has been 653,000 m3 (855,000 yd3). Miami Beach has been one of the most important tourist areas in Florida since the beginning of the century. Profiles in this study area have been surveyed several times and most of the data are available on the internet at the State of Florida, Department of Environmental Protection (DEP) web page, www2.dep.state.fl.us/water/beaches. The data available are summarized in Table 3.2. August 1992"' DEP Water Line NGVD Beach Profilest. DEP Department of Environmental Protection. CCCL Coastal Construction Control Line Photos. while the data of 1980 and 1996 extended seaward to the depth of closure, 4.6 m (>15 ft). It must be noted that in 1992 some monuments were moved seaward from their original locations. For calculation purposes it has been assumed that only the cross-shore coordinates of the profiles from different years changed. The data obtained from the sources listed above were used to compute MHW shoreline changes as well as volumetric changes. Cross-sections are plotted and compared to determine long-term changes that have occurred over the 19801996 time period. Table 3.3 lists the tidal data for the area of interest (Balsillie, 1987). Tidal Data for the Littoral Segment Located between Bakers Houlover Inlet and Government Cut. composite distributions are poorly sorted. The native beach curve is better sorted than the project borrow and post-nourishment curves. The post-nourishment material is slightly better sorted than the in-place material" (p. A-1). Also they commented that "The visual estimate of shell content for the native beach was 23 percent. The in place borrow material was 34 percent shell and the post nourishment beach was 39 percent shell. The higher percentage of shell in the fill material reflects the high carbonate content of the sand in the borrow areas" (p. A-1). Along Eight Profiles (Charles, 1994). of Government Cut (see Figure 3.6, panel d). The 1996 beach profiles from Monument R-60 to R-74 have almost the same shape as the previous 1992 profiles, as shown in Appendix A. Compared to the 1980, 1986 and 1992 data, there has been deposition on the foreshore zone and also on the bar causing an accretion of the shoreline. Panel a of Figure 3.6 compares the average profiles of 1980 and 1996 computed for the reach between Bakers Haulover Inlet (Monument R-27) and Monument R-65, and panel b between R-65 and Government Cut (Monument R-74). Also, panel a shows that the 1996 profile has adjusted toward a new equilibrium. The significant difference between the 1980 and 1996 profiles in panel b is primarily due to the construction of 5th Phase of the Nourishment Project. -from Moflum. R-27 to R65. 6 -from Monum. R-66 to R74. -2 -2 -........ .i .. ... ... .
R -58 to Mn. -from Monuf M R-50 to R58. R-58 to R-62. (Panel d) from Monument R-50 to R-58. 1975 shoreline position outside the area of nourishment in 1975 is probably due to the natural recovery following the Ash Wednesday storm of March 1962. The 1980 data show the shoreline position after the beach fill was placed from Monument R-3 1 to R-65. It is seen that the average shoreline advance was approximately 125 ma (410 ft). The fifth phase of the beach nourishment project, approximately from Monument R-65 to Government Cut, had not yet commenced. The 1981 data, as the 1980 data, show that the fifth phase of the project had not commenced. Figure 3.8 presents the annual rate of shoreline change between November 1980 and March 1981. In only 5 months the shoreline receded on average 13.4 m (44.0 ft), equivalent to an annual rate of 32.1 rn/year (105.3 ft/year). This is a result of the beach fill profiles adjusting rapidly to reach a new equilibrium. Between Monuments R-65 and R-66 the effect of the beach fill spreading out is also evident. The 1992 data (see Figure 3.7) show that the shoreline receded from its position in 1981 except for the reach between Monument R-65 and Government Cut due to the shoreline advancement associated with the fifth phase of the beach nourishment project. Considering only the beach area between Bakers Haulover Inlet and Monument R-65, the annual rate of shoreline change on average is -0.9 rn/year (-2.95 ft/year), which clearly shows that the beach profiles have almost reached equilibrium. A spreading effect due to the fifth phase of the nourishment can be noted updrift (north) of Monument R-65; the shoreline advanced instead of receding. 9.68 ft/year), while advancing from Monument R-60 to R-70 on average of 1.7 m/year (5.58 ft/year). Figure 3.9 presents the annual rate of shoreline change from 1992 to 1996 and the shoreline change from 1962 to 1996. The shoreline advancement between 1962 and 1996 is on average 98.3 m (322.4 ft) with a peak of 189.8 m (622.5 ft) at Monument R-67 and a minimum of 39.1 m (128.2 ft) at Monument R-36. Considering the annual erosional rate of 1992-1996, which is -2.4 m/year (-7.87 ft/year), it would take approximately 41 years before the average shoreline again reaches the 1962 shoreline position, which implies a good performance of the complete project. However, in some locations it would take only 9-12 years to reach the 1962 shoreline position, such as at Monuments R-34, R-36, R-58 and R59 (see Figure 3.9, Panel c). These areas are referred as Erosional Hot Spots (EHS) with the most severe EHS at Monuments R-36 and R-59. 5 0 .... .... ..
25 30 35 40 45 50 55 60 65 70 75 DEP Momnent No. 1981 (Note: This Is Primarily the Result of Profile Equilibration). 25 30 35 40 45 50 55 60 65 70 75 DEP Monument No. Figure 3.9 (Panel a) Annual Shoreline Change Rate for the Period 1992 to 1996.
by an Erosion Rate Have Been Included). The net sediment transport along the east coast of Florida is toward the south, as inferred from observations of sand impoundment at jetties and groins. Various estimates of the longshore sediment transport rate are available for the Miami Beach area. Before the beach nourishment and hurricane surge protection project started, the U.S. Army Corps of Engineers (USACE) estimated that the net transport rate was 15,280 m3/year (20,000 yd3/year) towards the south and the magnitude was affected by the presence of groins along the beach (USA/CESAJ, General Design Memorandum Phase I, July 1974). The Corps also estimated that the historic alongshore net transport rate would be 165,788 m3/year (217,000 yd3/year) towards the south if there were no barriers (groins) to affect the transport, with 146,688 m3/year (192,000 yd3/year) towards the north and 312,476 m3/year (409,000 yd3/year) towards the south. The Coastal Engineering Research Center (CERC) later calculated a net transport of 72,580 m3/year (95,000 yd3/year) towards the south, based on the Wave Information Study (WIS) Phase III wave data, with a gross annual transport of 168,080 m3/year (220,000 yd3/year) (USA/CESAJ, General Design Memorandum Addendum II, June 1984). A University of Florida study, reported by Wiegel (1992), estimated a net transport of 179,540 m3/year (235,000 yd3/year) towards the south, with 142,868 m3/year (187,000 yd3/year) to the north and 322,408 ma/year (422,000 yd3/year) to the south, consistent with the previous estimates of the USACE. Coastal Systems International Inc. in the Dade County Regional Sediment Budget, 1997, estimated a southerly net sediment transport of 3,820 m3/year (5,000 yd3/year). This latter estimate is not affected by groins. Data are available relative to the shoreline positions immediately after the beach restoration projects for only the first and second phases while those relative to the third through the fifth phases are available only for later periods. Appendix B presents plots of the distribution of the annual rate of volumetric change per unit longshore distance along the beach for different time intervals. Only the volumetric changes between 1980 and 1996 have been computed from the profile data, because they extend farther than the depth of closure. The other volumetric changes are estimated from shoreline changes, using a berm elevation of 2.0 m (6.50 ft) and a depth of closure of 5.0 m (16.4 ft). It has been assumed that the profiles recede or advance without changing form (Bruun, 1954, and Dean, 1977, 1991). It should be noted that, based on shoreline changes, from 1992 to 1996, the beach between Bakers Haulover Inlet and Government Cut has lost on average 8.56 m3/m per year (3.41 yd3/ft per year), which in four years equals 507,200 m3 (663,900 yd3), (Table 3.4). Because these results are based on shoreline changes, they are overestimates due to the effects of profile equilibration, which consists in a transport of sand from the upper to the lower (submerged) part of the profile reaching a more natural form, associated with the mean grain size used in the project. Volume Change Characteristics for Various Beach Segments, 1992-1996. It appears that a fraction of the sand lost between R-27 and R-60, approximately 26%, has been deposited between R-60 and R-74 creating a very wide dry beach. Volumetric changes for the reach between Monuments R-58 and R-65 are shown in Table 3.5, based on losses to the -2 m (-6 IR) and -4 m (-12 ft) contours (USA/CESAJ, General Design Memorandum Addendum I1, 1986). The volumetric changes show that most losses occurred in the nearshore region (landward of the 2 m (6 ft) contour). This suggests that the apparent loss of sand was principally due to slope adjustment not for Monument R58 to R-60. Additionally, none of the profiles experienced erosion for the -2 m (-6 ft) to -4 m (-12 ft) depth range indicating continuing profile equilibration. Volumetric Change Characteristics, from R-58 to R-65 for Various Depth Ranges, 1981-1986. 0 . . . . . . . . ..6. . . . . . . .. .. .. . .... . . . .. .. .. . . . . . . . .
. . . . . . . . . . . i . . . . . .... . . . . .... . . . ,-:" .. . . . . . . . . . . . . . . .
4 .. . . . .
. . I . . . . . . .: . . . . . .I . . . . . . . . . . . . . . . . . . . .
considering only the volumetric changes from 1992 to 1996 the volume loss is 507,200 m3 (663,800 yd3) and the corresponding volume loss rate is 126,800 m3/year (166,000 yd3/year) which is still lower than the estimated renourishment rate of 145,200 m3 /year (191,000 yd3/year). The total volume change between 1980 and 1996 based on profile changes (Figure 3.11) is positive while that based on shoreline change is negative (Figure 3.10). This is due to the fact that not all of the shoreline recession is caused by volumetric losses, but a major part is due to slope adjustment. Government Cut (Based on Profile Changes). the long-term volume change rate obtained from shoreline data between 1962 and 1996. The volume change rate based on shoreline data of 1980 and 1996 is -186,900 m3/year (-244,600 yd3/year), which is almost 6 times greater than the previous value and is believed to be a substantial overestimation. Figure 3.12 Comparison Between Volume Changes per Unit Length Based on Profile Changes and Shoreline Changes (1980-1996). active profile by suspension, as was evident by the "milky" color of the water for several years after nourishment. My interpretation is that the two major contributors of loss are due to fine sediment suspension and consolidation (loss of volume but not of sand). If this interpretation is correct the volumetric loss rates should decrease with time. Two erosional hot spots are located in the area of study: the first is between monuments R-55 and R-60 and the second between monuments R-33 and R-37. The characteristics of these two hot spots are summarized in Table 3.7.
period of time a seaward redistribution of the sediments will take place along the profile. The time scale of beach profile evolution may vary significantly. Under different conditions, some beaches reach equilibrium very quickly (3 years), others very slowly (10 years). Equation (3.2) represents the linear solution while Equation (3.3) is the non -linear solution. Note that this analytical model does not perform well for beach accretion, since no constructive mechanism has been considered. The decay parameter k has been estimated for the linear (m=l) and non-linear (m=2, m=3) cases for the littoral segment between Bakers Haulover Inlet and Monument R-65. Figure 3.13 presents the best fit curves of the average measured MHW shoreline changes determined by using the least squares method. It also shows how the equilibrium process is rapid during the first years (especially for m=3) and then decreases with time after the perturbation has been reduced by the waves. The different values of k and time scales required for an equilibration of 50% to the native profile (t50.) have been summarized in Table 3.8. The k and t50% values have also been computed neglecting the 1981 data, which appears anomalous. Based on the comparison in Figure 3.13, it is not possible to judge which value of m is more appropriate. List of the Parameters k and t,,, for Different Values of m.
Anna Maria Key is located in Manatee County approximately on the central west coast of Florida (Figure 3.14 ) along the Gulf of Mexico and includes the beaches of Holmes Beach and Bradenton Beach. Anna Maria Key is a sandy barrier island approximately 11. 5 kmn (7.2 miles) long and is bounded on the north by Passage Key Inlet and on the south by Longboat Pass. The barrier island is separated from the mainland by Sarasota Bay. Maps of the area of interest can be found on N.O.A.A. 's nautical charts no. 11414, 11424, and 11425. The limits of the area of interest extend along the reach of Gulf shoreline between DNIR (Department of Natural Resources) Monument R-9 and R-41 (Figure 3.15), focusing successively on those areas where EHS have been recognized. Figure 3.14 Manatee County Location. The two inlets which bound Anna Maria Key are natural inlets. Passage Key Inlet connects the southerly part of Tampa Bay with the Gulf of Mexico while Longboat Pass connects Sarasota Bay with the Gulf of Mexico.
" The construction of shoreline stabilization structures.
" The construction of the Manatee County, Florida, Shore Protection Project in 1993.
" Hurricane Opal in October 1995. Each of these is discussed in the following sections. The littoral segment included in the 4.2 mile nourishment project was heavily armored with revetments, seawalls, groins, and bulkheads by local interests first and public projects after. In the early 1950's, the District of Anna Maria Island Erosion Prevention installed about 100 stone groins varying in length from 15.2 to 21.3 m (50 to 70 feet) (USACE, 1991). In 1959, the state road department constructed an additional 20 concrete groins along the southern end of Anna Maria Key at Coquina Beach. In the subsequent years, two permeable groins, respectively 140 and 97 mn (460 and 320 feet) long, were built in an attempt to stabilize the shoreline. The Manatee County, Florida, Shore Protection Project was authorized by the Public Law 89-298 in 1965 and consisted originally in the restoration of 5.1 kmi (3.2 miles) of the Gulf beach of Anna Maria Key. In 1989, the authorized project was modified to provide for restoration of 6.7 kmn (4.2 miles) of shoreline and construction of a 0.8 km (0.5 mile) beach fill transition zone at the southern end of the project area in order to reduce the effects of the spreading out losses (Figure 3.15). in the north to R-35 in the south.Periodic required renourishments of approximately 508,000 m3 (664,800 yd3) were estimated every 9 years, corresponding to a renourishment rate of 56,500 m3/year (73,900 yd3/year). The sand was pumped from borrow areas located approximately 500-800 m offshore of the 1992 shoreline position, as is evident from the R25 through R-34 profile surveys. The design of the cross-section increased the berm width by approximately 23 m (75 feet) at an elevation of 1.9 m ( 6.2 feet) above MLW and included seaward slopes of 1:11 from the berm to the MLW shoreline position, and of 1:27 until intersecting the existing bottom profile. Figure 3.15 Limits of the Manatee County, Shore Protection Project. seconds were recorded by the National Data Buoy Center buoy number 42003, located approximately 210 nautical miles west of Manatee County. The Corps of Engineers (1996) reported that Hurricane Opal produced an estimated storm surge of 0.3 1.0 m (1-3 feet), strong winds and wave action. These conditions, combined with two higher than normal tidal events resulted in waves overtopping the beach berm, flooding the back area of the project and transporting sand to the back beach or offshore. Based on observations, the shoreline retreated an average of approximately 9.1-15.2 m (30-50 feet). The Corps also reported that the southern area of the project between Monument R-24 and R-33, was particularly affected. Various monitoring surveys have been conducted on Anna Maria Key. The data used in this study are listed in Table 3.9 All the dara are included in the State of Florida, DEP database which is available on the internet at the website www2.dep.fl.us/water/beaches/. The list presented above does not encompass all of the available data for the study area, but encompasses only the recent data set for the Manatee County, Shore Protection Project. It must be noted that monuments of some survey lines were moved during the years from their original position (12/1992). All the measurements have been referred to the monument positions of December 1992. The data listed above were used to compute MHW shoreline changes as well as volumetric changes. The tidal data for Anna Maria Key are listed in Table 3.10, (Balsillie, 1987). Tidal Data for Anna Maia Key, (Balsillie, 1987). native beach and borrow area are 1.47 4) (0.36 mm) and 1.76 4) (0.30 num), respectively. The two composite distributions are poorly sorted with a composite sorting value of 1.47 for the native sand and 1.51 for the borrow area sand. The mean value of the visual estimate of the shell content for both the native and the borrow area samples was 27 percent and 21 percent, respectively. Subsequently, an acid treatment was applied to all the samples in order to determine the contribution of the carbonate fraction (shells) to the grain size distribution. After removing the carbonate fraction, the composite mean grain size and the sorting were 2.52 4) (0. 17 mm) and 0.47 (well sorted) for the native sand and 3.0104 (0.12 mm) and 0.46 (well sorted) for the borrow area sand. The shell content was found to be 27% by weight for the native sand and 25.8% for the borrow area sand. Figure 3.16 shows the composite cumulative mean grain size distributions for the native beach and the principal alongshore borrow areas before and after the acid treatment. It must be noted that the ratio between the mean grain size of the borrow area and the native sediment is 0.70, which results in a greater volume of fill in order to construct the design berm width. Comparative profiles of the area of interest have been plotted at each Monument and are presented in Appendix A. The slope of the constructed beach was on average 1: 11 from the berm to the MLW shoreline position, and 1:27 from MLW shoreline position to the intersection with the existing bottom profile. Figure 3.17 presents the average profile pre(12/1992) and post-nourishment (8/1993) along with the 2/1995 survey. After 1.5 year more than 3/4 of the original beach width remains in place. It is interesting to note that after 1.5 year, the slope of the upper part of the profile (from the berm to -2.0 m) is steeper than the pre-and post construction slope, followed by a trough at approximately -2.0 m depth and again by a steeper slope in the lower part of the profile reaching the limiting depth of motion, which is on average 6.0 m.
In most of the profiles it has been seen that a portion of the sand has migrated from the foreshore seaward to the shore face as a result of the profile equilibration process, causing the expected recession of the shoreline. 1.5 year, both in the foreshore and in the shore face. Dean et al. (1998) calculated the long term (1874-1974) and short term (1974-1986) average shoreline change rate for Anna Maria Key, which are -0.36 rn/year and +0.90 rn/year, respectively; considering only the shoreline segment included in the nourishment, the average shoreline change rates are -0. 61 rn/year and -0. 13 rn/year. Figure 3.18 presents the shoreline changes after the construction of the shore protection project, where the shoreline position of August 1993 has been taken as a reference, avoiding in this way the effects on the shoreline due to the several coastal structures (groins, seawalls, and revetments) existing before the nourishment. Figure 3.18 Shoreline Position for Different Periods Relative to August 1993. The 1998 data show that in the project area (R-12 to R-35) after 4.5 years the shoreline receded on average 17.1 m. The average shoreline recession of the center segment of the nourished area (R-20 to R-26) is 8.2 m, while those of the northern (R- 12 to R- 19) and of the southern part (R-27 to R-35) are 20.0 m and 23.0 m, respectively. Greater shoreline recession on the extremities of the project is in qualitative agreement with the planform evolution theory. Table 3.11 summarizes the shoreline changes and the shoreline change rate for the different periods. Note that + is accretion while is erosion. Some observations are evident from the above table. The Anna Maria Key shoreline has experienced a surprising accretion in the period between August and October 1993, resulting in a potential accretion rate of 36.5 rn/year in the whole area from Monument R-9 to Monument R-41. After this initial anomalous behavior, the average shoreline change rate of the project area follows a consistent negative trend from higher to smaller values, as expected. The reduction of the erosion rates with time is principally due to two different factors, (1) the equilibrium profile process and (2) the diffusion process at the boundaries of the nourished area. relative to Monument R-23 which is located approximately at the middle of the nourished area, according to the expected beach platform response. The shoreline changes are quite small in the center of the project due to the small platform gradients. Average shoreline change rates have been calculated for the project (Figure 3.19, Panel b) and adjacent areas (Figure 3.19, Panel a and c). Initially, in the nourished area, the average shoreline change rate decreases with time (according to the beach fill response theory), while in the last period from July 1997 to February 1998 it increases again, but is still negative (recession). On the other hand, in the adjacent beaches the average shoreline change rate fluctuates from positive to negative values, possible due to seasonal effects. The Corps of Engineers (1991) suggested a divergent littoral drift regime for Anna Maria Key with the existence of a nodal point approximately in the middle of the barrier island shoreline. However, inspection of one of the permeable groins located near the nodal point showed that a southerly littoral drift was dominant. An exception to this is the northern part of the island. Walton (1976) estimated a weak littoral drift directed toward the south. The volumetric changes for the period between December 1992 and February 1995 have been calculated based on profile changes, while those between February 1995 and February 1998 are based on shoreline changes. The computations for these profiles measured in the area where the alongshore borrow area is located have been carried out to the limit of the dredged area due to the project construction, assuming that at that point the cross-shore sediment transport is small. Table 3.12 lists the volumetric changes for different periods and littoral segments. Volumetric Changes for Different Periods. 12/1992 8/1993 + 1,770,000& (+83,000)* +1,737,200& (+50,200)"
Difference Between Measured and Placed Volumes. It is seen that the volumetric changes oscillate with time. The area has experienced subsequent periods of accretion and erosion. The volume oscillations suggest possible systematic survey errors. Figure 3.20, panel a, shows the cumulative volumetric changes from 1993 to 1995. Their fluctuations vary from positive to negative values up to a magnitude of 20% of the original beach fill. These fluctuations may be related to seasonal effects, since during the winters the area experiences erosion while during the spring and summer it recovers. This particular behavior would be expected of the shoreline changes but unlikely of the volumetric changes. During the winter seasons the sand is forced by the more energetic waves to migrate from the beach face to the shore face region to form a bar, but the sand should still remain within the active profile system. Figure 3.20 panel b indicates that for the surveyed period from August 1993 to February 1995, the area within the original project lost an estimated 140,300 M3 of sand. This represents approximately 8% of the original b each fill. Figure 3.19 Shoreline Change Rate for Different Time Periods and Littoral Segments. The erosion rate associated with this volume losses is 93,500 m3/year, which is 65% greater than the estimated renourishment rate (56,500 m3). As of February 1995, the project has performed very well in terms of volume losses. It is seen also that most of the volume loss occurs in the southern half of the project site, adjacent to Longboat Pass, which can represent a sink of sand for the littoral system. Figure 3.20 Cumulative Volumetric Changes in the Project Area from 1993 to 1995. (Panel a), for Each Survey Time Interval. (Panel b), Relative to August 1993.
the middle segment of the nourished area (form R-17 to R-25) does not experience particular erosion, as do the two extremities. In July 1997, the volumetric losses reached almost 290,000 m3' while in February 1998 the losses were approximately 550,000 in'. The total volume losses from August 1993 to February 1998 (4.5 years) are approximately 690,300 m3' (41% of the original fill placed), corresponding to anl overall erosion rate of 153,400 m 3/year, which is greater than the estimated renourishment rate. It must be noted that the volume losses based on shoreline changes seem to be an overestimation. A significant percentage of the measured shoreline changes, especially in the time period immediately after the nourishment, are not due to volume losses but due to profile equilibration. As of February 1998, 59% of the volume of sand placed in the original shoreline segment is still in place. Figure 3.21 Cumulative Volumetric Changes in the Project Area Between 1995 and 1998. An estimation of the decay parameter k have been done for the linear and non-linear (m=2, m=3) cases. Figure 3.21 shows the best fitting curves of the average measured MIW shoreline changes determined by using the least squares method and it can be noted that the equilibration process is rapid during the first years (especially for m=3) and then decreases with time after the perturbation has been smoothed by the natural processes. The different values of k and time scales required for an equilibration of 50% to the native profile (t5o,) have been summarized in Table 3.13. List of the k and t,,, Parameters for Different Values of m.
It is seen that the non-linear solutions related to non-linear transport relationships will require more time (16 to 30 percent) in order to reach half profile equilibration. It is encouraging that equilibration time scale for Anna Maria Key is approximately the same as those determinated for the Dade County Project. Shore Protection Project for different values of m.
-.. . . . ... ... . . . . . . . . . . ... . . .. .... . . . . . . . . . . . . . . . . . . .
.... .............. ..... ii. . . . . ...... .. i ... ............... .... ..... . . ... .... .... . . . . .
A potential erosional hot spot (EHS) is defined as a local area which erodes more rapidly and/or equilibrates with a significantly narrower beach width compared to the adjacent beaches. It has been seen in Chapter 2 that many hot spots have been identified within different beach nourishment projects along either the Gulf or Atlantic coast of Florida. They are often located within beach nourishment projects which, globally, have performed well. In this chapter some criteria to identify the existence and the causes of EHS will be discussed. In conclusiontwo study cases will be analyzed based on these criteria: the Dade County and Manatee County beach nourishment projects. The identification of an EHS is based on historical shoreline and volumetric change analysis. The interpretation of the results of both analyses can lead to better understand the causes and the possible remedies to the EHSs. in which n is the number of measured data. If the available data are incomplete, s can alternatively be computed considering the shoreline changes predicted by planform evolution models (one-line model). In this last case, in order to avoid an under or over estimation of the s value, an adjustment of the shoreline changes due to the cross-shore equilibration process needs to be done (see paragraph 3.1.8). Note that in order to calculate the reference value s, shoreline change rates can also be used. The same procedure utilized to identify EHS can be followed to identify cold spots. The analysis of historical shoreline changes is also a useful tool during the beach nourishment design process in order to identify those areas that historically have greater erosion rates, therefore those areas which normally tend to erode faster than others. Note that shoreline recession is the most intuitive parameter used to recognize the presence of an EHS, especially by the public. The historical volume change analysis is conducted comparing beach profiles of different years, and is extended to the entire nearshore zone from the dry beach to the depth of limiting motion. A-fter the construction of a beach nourishment project, an analysis of the volumetric changes gives an estimate of the project performance regardless of the distribution of the placed volume across the profile. A similar analysis, as described for the shoreline changes, can be conducted for the volumetric changes. Those areas characterized by volume change rates of some percentage greater than a reference value, v, characteristic of the entire project area will be qualified as an EHS or a cold spot, depending on whether the volume change rate is negative or positive, respectively. The reference value v can be defined as in Eq. 4.1, where AIym, are now the measured volume change rates Aym. Note that no adjustment of the v value needs to be done in order to account for the cross-shore profile equilibration. A comparison between hot spots through shoreline change analysis and those identified through volumetric change analysis can be conducted, and three cases can occur (see Table 4. 1), which are discussed below. List of Possible Combination of Erosional Hot Soots. This is the case when the presence of an EHS in a littoral segment has been identified both by shoreline change and volumetric change analysis. If the presence of a cold spot has been observed in areas adjacent to the EHS, the possible causes could be: "spreading out losses" at the ends of a nourished area (sub-case a-1), presence of a borrow pit close to the shoreline (sub-case a-2), or residual bathymetry after the construction of the nourishment project (subcase a-3). These sub-cases are summarized in Table 4.2. Sub-case a-i can be analyzed using analytical or numerical computer models which predict the evolution of the nourished planform area and also predict the effects on the adjacent areas due to the diffusion processes of the beach fill. A comparison between the predicted and the measured planforms can show if the EHS, and consequently the cold spots, were due to the normal response of the shoreline to the diffusion process, which takes place under the action of the waves. This study is particularly helpful if different nourishment projects have been constructed at different times in the same area of interest. Various numerical models are available to conduct this studies. The "one-line" model DNRBS (Department of Natural Resources, Beaches and Shores) developed by Dean and Grant (1989) and described in Appendix B has been applied to two study cases and the results will be presented later in this Chapter. Note that the magnitude of the EHS and cold spots generated by this mechanism may decrease in time, once the anomaly is smoothed by the action of the waves. The effects of the presence of a borrow pit inside the nearshore zone (sub-case a-2) have been largely discussed previously in Chapter 2. A change of the wave front orientation results as well as of the wave energy distribution along the beach through wave refraction and diffraction (change in wave set up distribution). Usually a formation of a salient has been observed in the lee of the borrow pits and of hot spots in the adjacent areas (see Figure 2.2). Wave refraction-diffraction models can be employed to better analyze the impacts of borrow pits on the shoreline. A possible and simple remedy is to chose borrow areas outside the nearshore region where their impact on the shoreline is minor. This may result in a greater initial cost of the nourishment project, but will reduce renourishment costs successively. Wave refraction models can also be employed to analyze EHS and cold spots due to residual bathymetry (sub-case a-3). A remedy to this type of EHS is to exercise more care when the beach fill material is placed on the project area, probably reducing the distance between each pipe extension and trying to place a uniform amount of material along the beach. This is the case in which the presence of an EHS has been identified through shoreline change analysis, whereas the results of the volumetric changes for the same littoral segment show a stability. The possible causes could be a non uniform sediment size distribution (sub-case b-1), the presence of coastal structures, like seawalls and groins (subcase b-2). These sub-cases are summarized in Table 4.3.
volume fill density will be greater than in the adjacent areas with coarser sand. Probably during this process, a residual bathymetry will be formed, which illustrates the interaction of different causes of hot spots. A simple remedy is to add more compatible sand in those areas characterized by smaller sediment size in order to reach, after equilibration, the same beach width of the adjacent beaches. The application of a refraction model is suggested to determine if the residual bathymetry has a significant impact on the shoreline evolution. As discussed in Chapter 2, coastal structures, like seawalls and groins, can be employed to stabilize the shoreline, however, the volume losses continue resulting in deeper and steeper profiles. The littoral segments impacted by the presence of the structures could exhibit hot spots if no measures of overfill are taken during the design and construction process. In order to avoid that, a complete analysis of the beach profiles should be conducted before nourishing, to localize those areas impacted by coastal structures. Also it is possible to estimate the additional amount of volume required in those areas in order to create a stable beach of the desired width. This is the case when the presence of an EHS has been observed only through volumetric changes, and the shoreline is substantially stable. The possible causes are summarized in Table 4.4. Shoreline and volume change analyses conducted in areas where seawalls are present can also show a stable shoreline position while conversely volume losses occur. The shoreline position is maintained stable by the seawalls whi le the erosion process still takes place, deepening the profiles. This case is similar to the case analyzed in the previous section but occurs during a different time period, before the construction of the beach nourishment proj ect. which tend to be smoothed by the waves and will be characterized by greater erosion rates (EHS) than those of the adjacent areas. Waves force the sediments to move, changing in time the configuration of the shoreline. Utilizing numerical computer models, the average characteristics and alongshore distribution of the parameters of the breaking waves (height and direction) can be estimated. Also, the average alongshore breaking wave energy density distribution can be computed. Those areas characterized by a particular high value of energy density may be defined as potential erosional hot spots. In this phase, an important role is played by the offshore bathymetry (residual bathymetry) through the wave refraction and diffraction process, especially, when dredged holes were created offshore of the project area. In addition to the breaking wave energy density, the potential longshore sediment transport distribution can be computed utilizing the CERC formula expressed in terms of breaking wave conditions. The sediment transport results may be interpreted to predict shoreline behavior. The gradient of the potential longshore sediment transport is a measure of its acceleration. For example, in those areas where the potential sediment transport decelerates, accretion would be expected, while in those areas where it accelerates, erosion would be expected and depending on the magnitude of the acceleration, hot areas can be individuated. Two case studies of hot spots are presented below: those in the Dade County, and Manatee County projects. Different criteria have been applied in order to identify the existence, and the causes of erosional hot spots after the construction of the beach nourishment projects. Figure 4.1 shows the shoreline change rates over to the 1980-1996 period. The reference value of erosion/accretion rate, s, is represented by the dotted line which has been calculated following the criteria discussed in paragraph 4. 1. 1, and has been found to be equal to 2.6 rn/year. All the areas having erosion and accretion rates greater than s, in absolute value, qualify as EHS and ECS, respectively. Based on this criterion the presence of three erosional hot spots has been observed (1) from monument R-54 to R-60, (2) from R-33 to R-37 and (3) from R-49 to R-52. Figure 4.1 Dade County. Hot Spot Locations Based on Shoreline Change Analysis for the 1980-1996 time period. Analysis for the 1980-1996 time period. of v has been computed neglecting the data from R-65 to R-74 which are considered too large. The areas having greater erosion/accretion rate than the reference value, which could be considered as EHS or cold spots, are shown in Figure 4.2; these areas are, (1) in the vicinity of Monument R-30, (2) from R-34 to R-36, and (3) in the vicinity of R-50, and (4) from R-58 to R-59. Figure 4.3 presents the shoreline change rates for the time period between 1992 and 1996. A running average considering five consecutive points has been done to smooth the shoreline change values. Applying the same method used above a reference value of s equal to 2.3 rn/year has been found. Three EHS have been localized, (1) from R-32 to R-40, (2) from R-48 to R-52, and (3) from R-55 to R-59. A cold spot has also been individuated from R-62 to R-67. 20... .... e...e.. V... lue,.. Analysis for the 1992-1996 time period. Comparing the locations of the EHS identified by shoreline and volume change analyses, they seem to match fairly well, except for the EHS located in the vicinity of Monument R-30, which has been observed only from volume change analysis. The presence of coastal structures in this area was particularly significant. The numerical model DNRBS, discussed briefly in Appendix B, predicts shoreline changes in the vicinity of a beach nourishment project. A slightly modified version of the DNRBS model also includes the effects of subsequent multiple nourishment projects on the same area. The DNRBS model was applied to the approximately 15 km long beach, between Bakers Haulover Inlet and Government Cut. In the time period from 1980 to 1996, an average of approximately 480,000 m3/year was placed in the study area as part of the beach erosion control and hurricane surge protection project and also, as part of the renourishment program. The DNRBS model assumes straight and parallel shoreline and contours, and that the nearshore system has approached a near equilibrium, the details of which present modeling techniques cannot represent adequately (Dean and Yoo, 1989). The beach fills were placed on the idealized 1975 shoreline which is believed to be in a near equilibrium. The representative wave characteristics for the site of interest are those recommended by Dean and Grant (1989): effective deep water wave height, H, = 1.0 ft (0.3 in), effective wave period, T= 6.0 s, and 0o = a. = 870. Moreover, / = 1800, and a sediment transport coefficient of K=1.1 were chosen. The area of interest is bounded on the north and south by inlets, which are stabilized by long jetties. At Bakers Haulover Inlet and Government Cut, it was assumed that the sediment transport, was zero. Wave refraction and diffraction processes are neglected by the numerical model, thus the wave angle is constant along the entire project area. Figure 4.4 presents a comparison between the 1996 measured and predicted shoreline positions relative to 1980. A general agreement can be noted in the area between Monument R-48 and R-65, and also between R33 and R-45. Note that the one-line model does not account for cross-shore profile equilibration, so the predicted shoreline changes should be adjusted for the recession due to the cross-shore equilibration. In the southern area, from Monument R-65 to Government Cut a significant accretion has also been predicted but with a different distribution. The Phase 5 nourishment was placed in this time period from Monument R-65 to Monument R-74. Conversely, in the northern area, the predicted and measured 1996 shoreline position experienced erosion since no sediment supply is allowed to bypass Bakers Haulover Inlet and the waves generates a southern directed sediment transport. 00- 1980 to 1996 predicted. for the 1980-1996 Time Period. Rates for the 1980-1996 Time Period. Fi r E Rate for -h 18-96Tm Pro. supply. Globally, the results obtained from the application of the DNRBS model seem to be questionable due to various uncertainties, as for example the wave direction relative to the normal of the shoreline, and the sediment transport rate coming in and out, respectively, from the northern and southern boundaries. The sediment size distribution along the project for different water depth is plotted in Figure 4.6 (Charles, 1994). The average sediment size decreases gradually from approximately 0.47 mm at R-30 to 0.29 mim at the vicinity of Government Cut. It can be noted that the sediment size distribution of the NGVD waterline presents a peak between R52 and R-62, which could suggest that greater waves with higher associated wave energy act on that beach segment and that the finer sediments have been winnowed out. Contours. (Based on Sampling Along Eight Profiles (Charles, 1994)). Since the project area has a very high tourist value, many hotels and recreational facilities were built very close to or seaward of the MHW contour line. The solid line (reference) of Figures 4.7 and 4.8 is the average MHlW shoreline position relative to the period before hotels and facilities were constructed (1867 1936), while the dotted line represents the seaward boundary of the area where the hotels and facilities are now located. It is evident that the "construction line" is seaward of the reference shoreline position between Monument R-30 and R-36, and between R-56 and R-60. Nourishment in the vicinity of these projections will be smoothed by wave and current action, and will be characterized by greater erosion rates. Several EHS and ECS were observed along the Dade County beach. It seems necessary to conduct a refraction study in order to obtain the breaking wave distribution, and therefore the breaking wave energy density distribution along the area of interest, in order to identify those areas which are characterized by higher wave action. Probably the reference value to use, could be calculated in the same way is calculated for shoreline and volume changes. Shoreline Position (1867 to 1936), from Monument R-27 to R-37. Shoreline Position (1867 to 1936), from Monument R-53 to R-61. filled area, approximately between Monument R-33 and R-26, and between R-16 and R-12, with a maximum recession rate of 10 rn/year and 8.5 rn/year, respectively. The designed advance of the MIHW shoreline was approximately 40 mn If the recession rate were constant in time, in those areas with higher rates it would take approximately from 4 to 5 years to reach again the pre-nourishment shoreline position. Note that the high values of erosion rates calculated includes also the shoreline recession due to profile equilibration. Shoreline changes relative to a shorter period of time (8/1993 to 2/1995) are presented in Figure 4.10 The reference value of erosion/accretion rate, s, has been found equal to 6.7 rn/year. Two EHS were observed, from R-32 to R-28, and from R-16 to R-13, and their locations approximately match with those observed from volume change analysis. Also a cold spot was observed in the southern area of the project, from Monument R-36 to R-35. The s value relative to the shorter period of time, 1.5 year, is greater than that relative to a longer period of time, 4.5 years, and this shows how the profile equilibration rates decrease with time. The same procedure has been followed for the volumetric changes. Volume change analysis has been conducted only for the time period from 8/1993 to 2/1 995, since the 2/1998 data were wading profiles. Figure 4.11 presents the volume change rate for the project area relative to the period between 8/1993 to 2/1995. The dashed line is the reference value of volume erosion rate, v, for the area of interest, and it has been found to be equal to 45 mn3 /r/year. Three EHS have been identified, and they are located approximately between Monument R-34 and R-33, between R-30 and R-29, and in the surrounding area of R-27. Also a large cold spot was observed from Monument R-12 to R-10. Figure 4.9 Manatee County. Hot Spot Locations Based on Shoreline Change Analysis for the 1993-1998 Time Period. for the 1993-1995 Time Period. for the 1992-1998 Time Period. where the measured volumes are considerably greater that the predicted and placed. Note that near the extreme north and south ends of the project, the effect of the volume sink effects of the inlets are evident. The beach segments located in the surrounding area of Monument R-T-30, between R-28 and R-26, and from R-24 to R- 19 are performing slightly worse than expected. It has been seen in Chapter 3, that the volumetric changes in this area oscillate significantly, suggesting possible systematic survey errors. A refraction/diffraction study seems to be necessary in order to localize those areas where concentration of wave energy occurs, especially in the lee of the borrow pit.